§the supervising partner or manager. Specific tasks may be allocated to other members of the team. We will tell you the name/s of any other fee earner/s working on your matter and their status. We try to avoid changing fee earner but, if we have to, the new fee earner will explain promptly why the change was necessary. Work is contentious or non-contentious. Contentious work is defined in the Solicitors Act 1974. We conduct routine checks for conflicts of interest on accepting instructions. We can only accept your instruction if no conflict exists or is likely to develop. If that situation changes during a matter we will talk with you about how to resolve it. We may have to stop acting for you if a conflict arises. This may occur because we have discovered or are aware of information obtained whilst acting for another client which we would normally have to tell you about. However telling you about that information would conflict with our duty of confidentiality to the other client. In this event, we reserve the right to withhold this information and stop acting for you. In certain cases, we may continue to act for you and the other client, but only if we are able to observe our duty of confidentiality to you. We charge either by hourly rate or fixed fee. Whatever the agreed basis of charging, we will add VAT at the rate that applies when the bill is prepared, at present 20%. You are responsible for payment of our charges even if you have entered an agreement with another to pay or share payment. Each client matter has a unique number. Details of current hourly rates are in our Engagement letter. Rates are reviewed every 01 April and we will agree any changes with you. The hourly rate depends on the seniority of the fee earner and the matter’s complexity and urgency. The rate is applied to time spent, for example, on research, meetings, making and receiving telephone calls, correspondence, advocacy and travel. We will in our Engagement letter give you an estimate of the costs and confirm to you the rates which will be applied to particular fee earners. This is not a firm quote and may need to be varied as the matter progresses. We will notify you if it varies. We will provide you with details of the time spent and fees incurred to date on a regular basis or on request. We will agree with you the timing and frequency for submission of invoices. If for any reason we cease acting for you, unless agreed otherwise, we will charge you for the work done and expenses incurred. We reserve the right to ask you to pay us money on account of profit costs, VAT and disbursements. We may agree to carry out work for a fixed fee. It will be quoted in our first letter to you. If at any stage it becomes impractical to complete the matter for the fee agreed, we will inform you and seek to agree a revised fee prior to incurring any additional charges. We may incur expenses which we require you to reimburse. These may include counsel’s or expert’s fees, court fees, travel expenses, courier’s fees and photocopying costs. Wherever possible we will inform you of the relevant amounts before they arise. VAT may be payable on certain expenses. We will discuss with you the range of funding options including the availability of insurance in relation to each individual matter. Invoices may be issued as work is completed and are due for settlement on delivery. You will retain ultimate liability for the full amount of our costs even if a third party, who is not our client, has agreed to be responsible for the whole or part of them. Payment is due to us within seven days of date of the invoice. If bills remain unpaid, we reserve the right to suspend work pending settlement. In the event that, for any reason, instructions are withdrawn or discontinued, time spent and expenses and disbursements incurred to date will be due and payable. We may charge interest on all, or part of our bill if it remains unpaid. §we reserve the right to exercise a lien and withhold your file pending payment. Should it become necessary to issue legal proceedings for outstanding monies, any costs incurred which will include debt recovery agents’ charges, court fees and any other legal fees will be added to the amount owing, together with interest at the statutory rate. If you have a complaint about a bill, you should deal with it under our Complaints procedures set out later in this document. There may also be a right to object to a bill by making a complaint to the Legal Ombudsman and/or by applying to the court for an assessment of the bill under Part III of the Solicitors Act 1974. If you anticipate a problem in paying future bills please tell us as soon as you can. If we hold some money belonging to you in client account, we can deduct any amount you owe us from that sum. You are responsible for paying our bill(s) in full even though in some cases our charges and expenses may be recovered partially or in full from another party. We will discuss with you the circumstances in which this may occur. We will also discuss whether you may be responsible for paying some or all of another party’s charges and expenses. We ask you to provide us with clear, timely and accurate instructions, maintain regular contact and provide any documentation requested, safeguarding any documents that may be required. We cannot be responsible for loss or damage suffered if we rely upon inaccurate, incomplete or late information provided by you. Please read this section carefully. It contains restrictions on our liability in the event of a claim by you. We will use reasonable skill and care in the provision of legal services to you (“the services”). The Engagement letter summarises our understanding of your instructions. We are not responsible for matters which fall outside the scope of those instructions. The services are provided in accordance with our professional practice rules and guidelines and the proper interpretation of laws, court decisions and regulations in existence on the date on which the advice is provided. Changes in the law and interpretations may take place before our advice is acted upon, or may be retrospective in effect. We accept no responsibility for such changes in the law, or in interpretations of the law, occurring subsequent to the date on which our advice is delivered to you. §any other liability which by law we cannot exclude. We will accept liability to pay damages in respect of loss or damage suffered by you as a direct result of any breach of our responsibilities to you under these Terms and Conditions, or our failure to take proper care arising from the provision of services, but subject to clause 12.3 the total aggregate liability of Burton Copeland LLP or any other Burton Copeland LLP entity, and its or their partners or employees (whether arising as a result of a breach of our responsibilities under these Terms and Conditions, or our failure to take reasonable care or otherwise) under this clause shall in no circumstances exceed £3 million or such amount as may be stated in the Engagement letter. Any individual, who is acting on behalf of Burton Copeland LLP, whether they are a member or an employee, will not be personally liable at all for any act omission or negligence in the course of the conduct of the matter. No liability will in any event apply in respect of any incidental, indirect, special or consequential damages, including but not limited to loss of revenue. Note however that these exclusions shall not apply to any claim in respect of the death of or injury to any person. Subject to that, please note that by entering into an agreement upon these terms and conditions, you are agreeing to limit your potential ability to claim. §we are not liable for monitoring or notifying you of any post completion dates, once a matter is concluded. In no event will we be liable for any loss, damage, cost or expense arising in any way directly or indirectly, from failure by you or your employees or agents to exercise reasonable skill and care in connection with carrying out any matter as a consequence of or the subject matter of which is relating to the Services or any fraudulent acts or omissions by you or them. We shall answer enquiries over the telephone or in meetings on an informal basis. As these may involve an immediate answer to a complicated problem in respect of which we may not have received full and accurate information, we shall have no liability to you in contract or tort (including negligence) for our answers unless confirmed in writing. You should neither act nor refrain from acting on the basis of such answers unless they are confirmed in writing by us. Any draft documents we might provide will not constitute our definitive agreements, opinion and conclusions which will be contained solely in a final written product. After a matter has concluded, we are entitled to keep all the papers relating to it if there is money owing to us for our charges. We will keep your file of papers, which may be in electronic format, for up to 6 years except those papers that you ask to be returned to you. We keep files on the understanding that we can destroy them 6 years after the date of conclusion of your case. If we take papers or documents in relation to continuing or new instructions to act for you, we will not normally charge for such retrieval. However, we may charge you a fee of £25 for any work necessary to comply with your instructions in relation to the retrieved papers or if you require your file of papers returned to you. We will always keep the file of papers or the electronic format of your file (except for any of your papers that you ask to be returned) for at least six years after the matter has concluded. We will not destroy documents that you ask us to keep safely, for which service we may impose an annual storage charge. However, if we continue to act for you, we will not normally charge to store or retrieve papers from storage. Anti money laundering and counter terrorism legislation requires us to ask you to prove your identity and address to us before we progress your instructions. Failure to do so will likely mean we cannot act for you. Delay in providing requested evidence will delay progress of your instructions. and we are obliged to continuously monitor the transaction and the need for identity details (and we achieve that in part by online searching). for an individual £10 (£5). for a UK company £35 (£20). for a European company £75 (£20). for a North American company £120 (£25). for the rest of the world £145 (£40). We are unable to distinguish precisely between the level of disbursement and the administration cost element because we may pay for searches online on an annual basis, the cost per search only being calculable at the year end depending on the numbers of searches carried out. Personal information that you provide may be disclosed to a credit reference or fraud prevention agency which may leave a credit search footprint. You can ask to see a copy of the search results if you wish. If you wish to discuss the search fee or how it is calculated please contact our Practice Director on 0161 827 9500. In all cases you are required to produce documents to prove ID and address. Usually a UK driving licence or National ID card will suffice. We may need your passport and a utility bill. We will need to take copies of documents produced for certification or you may be asked to have documents certified by an acceptable person. We have a policy of not accepting payments, even of bills, in cash (unless under £500). If you think that may cause a problem, please discuss it with us as soon as possible. If you try to avoid that policy by depositing cash directly with our bank, we may charge you for additional checks, necessary to prove the source of the funds. If we have to pay money to you it will be paid by cheque or bank transfer, not in cash and not to third parties. Solicitors are under professional and legal obligations to keep affairs of clients confidential. However recent legislation on money laundering creates a legal duty in certain circumstances to disclose information to the National Crime Agency (NCA). If this happens we may not be able to tell you because the law prohibits “tipping off”. Our duty to report includes any transactions which appear to us suspicious. The Proceeds of Crime Act 2002 (“the Act”) creates a number of offences relating to the proceeds of crime which you should be aware of when you instruct us. The proceeds of crime are any monies/property/assets which have arisen as a result of any crime. These include, for example, monies (however low in value), saved as a result of tax evasion, whether that money has been saved or spent. If we become aware or suspect the existence of the proceeds of crime in your case (whether from you or from any other person), we may have to report the irregularity to the NCA. NCA may withhold permission for us to continue with the case. NCA can pass the information received to any relevant body such as HM Revenue and Customs and an investigation may take place at any time in the future. It follows that if you have any concerns about irregularities in your financial position you may wish to seek specialist accountancy advice to correct those irregularities. We strongly recommend that you do this before proceeding further. Please note that accountants are also required to comply with the provisions of the Act. It is important that you are aware that we may have a legal duty under the Act to report known or suspicious circumstances without telling you. This could have serious consequences for you. In rare situations you could find that you then become subject to an HM Revenue and Customs investigation or benefits investigation and/or criminal proceedings. The obligations we have under this Act can, in certain circumstances, override the duty of solicitor/client confidentiality. Circumstances may arise where we have to approach you to seek your permission to report certain matters to NCA. For instance we may take the view that by proceeding further with your case (without permission from NCA) we may be assisting in the commission of a money laundering offence. In the event that you refuse such permission we reserve the right to terminate your instructions and if we do so in these circumstances you will be liable for all our fees and expenses incurred up to the date of such termination. We may decide to stop acting for you (permanently or temporarily) only on reasonable notice and with good reason. Examples are if an unforeseen conflict of interest arises, we are unable to obtain instructions from you, you do not pay an interim bill or comply with our request for payment of anticipated expenses, if there is a breakdown of the relationship of trust and confidence or if your instructions might put us in conflict with our Code of conduct or the law. You acknowledge that any copyright and other rights of whatever nature subsisting in or attaching to the product of the Services, including reports and agreements provided by us, will belong to us absolutely to the fullest extent permitted by law. You may only copy or use such documents to the extent their copying or use relates to the subject matter of the Services or for keeping copy records concerning the Services. We value your business and do not wish you to have any reason to be unhappy with us. We are confident of providing a high quality service. We have a duty to seek to resolve problems that arise with our services. It is therefore important that you raise any concerns you may have with us immediately. If you have any queries about our work for you or about a bill you have received, please raise them with the named fee earner with day to day responsibility for the matter or with the supervisor. 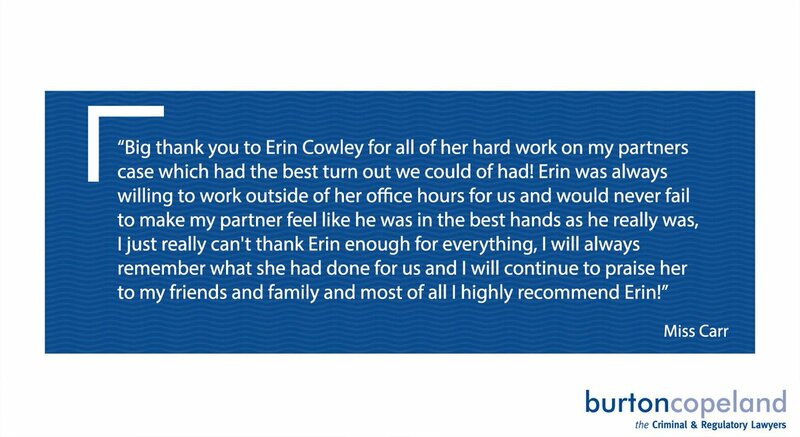 If that does not resolve the situation to your satisfaction, or if you prefer, please contact the complaints partner, Louise Straw on 0161 827 9500 or email louisestraw@burtoncopeland.com. A copy of our complaints procedure is available on request. If when we tell you that we have finished investigating your complaint (usually within eight weeks) you are unhappy with our conclusion you may write to the Legal Ombudsman at PO Box 6806 Wolverhampton WV1 9WJ. E-mail: enquiries@legalombudsman.org.uk. Telephone: 0300 555 0333. You should do that within six months of your last contact with us or within six years of the act or omission about which you are complaining occurring (or if outside of this period, within three years of when you should reasonably have been aware of it). Our e-mail is encrypted. Whilst we take all reasonable security measures, there is a risk of interception. We cannot accept responsibility for any loss arising from a third party gaining access to e-mail between us. We will assume that you consent to the use of e-mail unless you tell us in writing that you do not. We have Lexcel, the Law Society quality standard mark. As part of this system, your file may be inspected by an independent certification agency. The agency will not examine the detailed contents of the file and both they and we are bound by strict rules of confidentiality .In addition, the Solicitors Regulation Authority, the Legal Aid Agency and the Law Society may require access to your file as part of their annual assessment process for their Lexcel standard which we hold. If you do not wish your file to be inspected, please advise us. We are bound by the Solicitors’ Code of Conduct 2011 which can be viewed at www.sra.org.uk. We may request other organisations or people to do typing, copying, binding or other necessary tasks on our files to ensure that your case is handled effectively. We always seek a confidentiality agreement with those outsourced providers and if you would prefer not to have your file outsourced please let us know as soon as possible. If any provision of these Terms and Conditions is found by a competent court or administrative body of competent jurisdiction to be invalid or unenforceable, such invalidity or unenforceability shall not affect the other provisions of these Terms and Conditions which shall remain in full force and effect. If any provision of these Terms and Conditions is found to be invalid or unenforceable but would be valid or enforceable if some part of the provision were deleted, the provision in question shall apply with such deletions as may be necessary to make it valid and enforceable. In the event of any conflict between these Terms and Conditions and the Engagement letter, these conditions shall take precedence. In the event of a conflict between these terms and a client’s Service Level Agreement (SLA), the SLA prevails. Your continuing instructions amount to your acceptance of these terms and conditions of business. Unless otherwise agreed, these terms of business apply to any future instructions you give us. The Law Society is a designated professional body for the purposes of the Financial Services and Markets Act 2000 but responsibility for regulation and complaints has been separated from the Law Society’s representative functions. The Solicitors Regulation Authority is the independent regulatory body of the Law Society and the Legal Ombudsman is the independent complaints handling body of the Law Society. We are a data controller and bound by the Data Protection Act. Your file will be both in hard copy and electronic format. We are entitled to obtain process, use and disclose your personal data to enable us to discharge our duties to you, to liaise with third parties on your behalf such as barristers or expert witnesses and to comply with the law, update client records, produce management data, prevent crime and comply with regulatory requirements. It is agreed between us that the Contract (Rights of Third Parties) Act 1999 does not apply to our terms of engagement. Burton Copeland LLP is a limited liability partnership, registered in England and Wales, registered number OC316122, registered office Madison Place, Northampton Road, Manchester M40 5AG. We are regulated by the SRA under ID 439391. We use the word partner to refer to a member of the LLP, or an employee or consultant with equivalent standing and qualifications. A list of members’ names is available at our registered office. Anyone undertaking work on this matter does so as an employee or member of the LLP not personally and accepts no personal liability. Burton Copeland LLP is committed to promoting equality and diversity in all of its dealings with clients, third parties and employees. Please contact us if you would like a copy of our policy. The construction of these terms and conditions is governed by the laws of England and Wales, Burton Copeland LLP and drivingoffences.com. Any dispute or legal issue arising from our terms of business will be determined by the law of England and Wales and considered exclusively by the English and Welsh courts. Any money received on your behalf held in our general client account will have interest calculated and paid to you at 0.5% below the current base rate, if the base rate is 0.5% or lower, interest will be credited at 0.1%. The period for which interest will be applied normally runs from the date we hold cleared funds until the date on the payment(s) issued to you. c)where the sum held exceeds £20,000 and is held for one week or less, no sum in lieu of interest will be payable unless it is deemed fair and reasonable to make such a payment in all the circumstances. Where monies are held in a separate designated client account the whole of the interest earned will be credited to the account. You have the right to cancel this contract within 14 days of the initial instruction without giving any reason. If we have not met you or our retainer is concluded away from our premises the Consumer Contracts (Information, Cancellation and Additional Charges) Regulations 2013 may apply to our retainer, if so, you can cancel your instructions to us within 14 days of receiving this letter without giving any reason. To exercise your right to cancel, you must inform us of your decision by letter sent by post, fax or email. We will not start work during the cancellation period unless you expressly request us to do so. If you have given instruction to start work during the cancellation period, you will not lose the right to cancel but you may be charged for the work carried out, plus any expenses and disbursements incurred. We have a detailed Business Continuity plan which we are happy to discuss with you. Our plans include offsite storage of our core systems and data to ensure we can continue to meet your requirements even in the event of an incident that affects our usual place of business. The firm maintains professional indemnity insurance in excess of the minimum required by the Solicitors Regulation Authority. Our primary insurer is Travelers Professional Risks Ltd. The Legal Ombudsman (see paragraph 17 above) may provide a non judicial dispute resolution procedure.